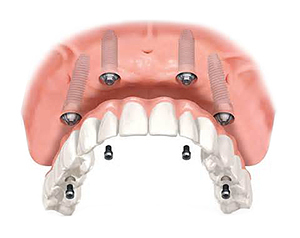 When all teeth are missing or in such condition that they need to be replaced, a fixed bridge anchored to dental implants is the best permanent solution. Today it is possible to replace a full jaw with dental implants and a fixed bridge that results in a permanent, stable and highly esthetic solution. These teeth are brushed and cleaned like natural teeth.